With all the negative headlines lately about the economy and the stock market, you might be inclined to just put your head in the sand and tune everything out. Maybe you’re tempted to turn off your TV, shut down your computer, and ignore your financial advisor’s phone calls. And one of the few ways to profit from it. If you’ve been ignoring the financial news lately, you may have missed a recent report from the global consulting firm, PricewaterhouseCoopers (PwC). This report has nothing to do with stocks, bonds or options. But it could still help investors make a lot of money. In 2018, about $99.5 billion was invested in the private markets. To put that in perspective, when we started publishing this newsletter back in 2013, that figure was just $36 billion. So in just five years, overall investment activity in this market has increased by nearly 300%. For investors in the know, the private markets have become the asset class of choice. You see, historically, only the professionals known as “Venture Capitalists” invested in early-stage, private tech companies. But as the profitability of early-stage investing became clear, other types of investors started to invest here, too. For example, mutual fund giant Fidelity — which traditionally, only invested in public companies already listed on the stock market — has invested billions of dollars into private tech companies like Pinterest and Uber. If you’re a longtime reader of our newsletter, this shouldn’t come as a surprise. As we’ve been showing you for the past five years, the private markets are one of the most profitable asset classes of all time. 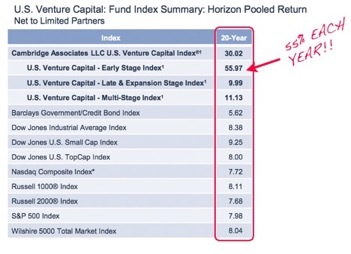 Even when you factor in the winners and the losers, early-stage private investing has been, by far and away, the most profitable long-term asset class. In fact, as you can see in this chart, these investments have returned roughly 55% per year for the past 20 years. 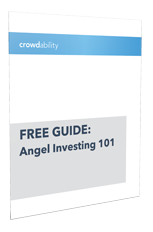 At 55% per year, in just 20 years, you could have turned a $1,000 investment into more than $6 million. And to be clear, for investors like you, this is just the beginning. You see, the level of capital flowing into the private markets is only increasing. And the more capital that’s available, the more deals there will be. And the more deals there are, the more opportunities there will be for you to earn big gains outside of the stock market. But we have to warn you: the private markets don’t come without risk. If you try to invest in this new market on your own, you could get hurt. If you haven’t done so already, we’ll be giving you the chance to make your first private market investment. And the best part is, Matt and I will be there to hold your hand every step of the way. We’ll explain more in next week’s newsletter… so stay tuned!